Janine is a 19-year old from Barbados, with an unwavering passion for life. Four years ago, she was diagnosed with scoliosis and has been confined to wearing a brace 23-hours a day. Through it all, Janine remained committed to living her life to the fullest. Last year, she won a prestigious honor of serving as an ambassador for her parish, and spent the year focusing on improving agriculture within her community as a way to better her nation. 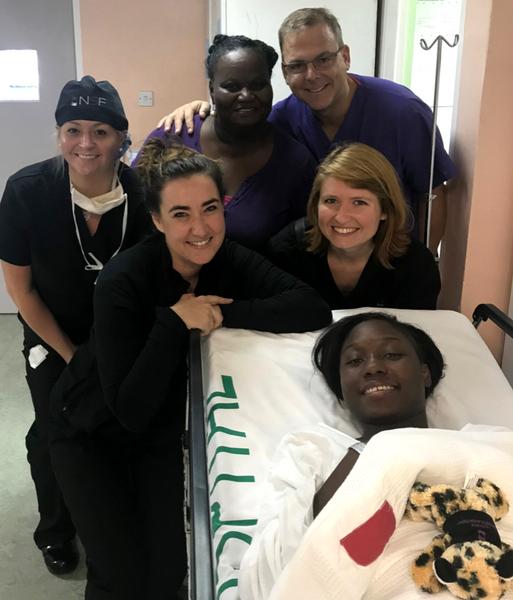 Janine was one of eight surgeries performed on the December 2017 NuVasive Spine Foundation (NSF) Direct Mission to Barbados in partnership with World Pediatric Project. Once she has healed from her surgery, Janine hopes to utilize her diploma in Health Sciences to become an EMT and help people in need. Donate today, to ensure patients like Janine have the opportunity to live their lives to the fullest. Janine, her mom and the NSF team are all smiles and ready for surgery!